Jason Hartman and Jonathan Emord, Esq. discuss the conflict of interests found within the FDA and their history with hiding the negative aspects of prescription drugs, as well as the benefits of natural remedies. According to Mr. Emord, “Perhaps as many as 15% to 20% of all drugs on the market today are ones that carry serious side effects, including heart attack, stroke, neurological disorders, kidney failure, liver failure, and death.” More at: http://holisticsurvival.com/category/audio-podcast/. Jonathan W. Emord is one of the nation’s leading free speech attorneys. He has defeated the Food and Drug Administration a remarkable seven times in federal court, more times than any other attorney in American history, earning him the title, “FDA Dragon Slayer.” He is the 2007 recipient of the Cancer Control Society’s Humanitarian Award for “winning and preserving our great civil rights to life, to liberty, and to health freedoms.” He is the only non-scientist ever appointed to the Certification Board for Nutrition Specialists and serves as that organization’s Vice Chair. In 2010, he became the first person awarded the title “Honorary Nutrition Specialist” by the CBNS. He is also a member of the Governing Council of the International Society of Regulatory Toxicology. Congressman Ron Paul says “[a]ll freedom-loving Americans are in debt to Jonathan Emord for his courtroom [victories]” and calls him a “hero of the health freedom revolution.” Formerly an attorney in the Reagan Administration’s Federal Communications Commission, Emord has practiced constitutional and administrative law in Washington, D.C. for the past twenty-five years. He is routinely consulted by industry, Congress, and the media on regulatory issues that affect health freedom. He is the author of four critically acclaimed books: Freedom, Technology and the First Amendment (1991); The Ultimate Price (2007); The Rise of Tyranny (2008); and Global Censorship of Health Information (2010). Mr. Emord is the American Justice columnist for USA Today Magazine. Narrator: Welcome to the Holistic Survival Show with Jason Hartman. The economic storm brewing around the world is set to spill into all aspects of our lives. Are you prepared? Where are you going to turn for the critical life skills necessary to survive and prosper? The Holistic Survival Show is your family’s insurance for a better life. Jason will teach you to think independently, to understand threats and how to create the ultimate action plan. Sudden change or waste case scenario, you’ll be ready. Welcome to Holistic Survival, your key resource for protecting the people, places, and profits you care about in uncertain times. Ladies and gentlemen, your host Jason Hartman. 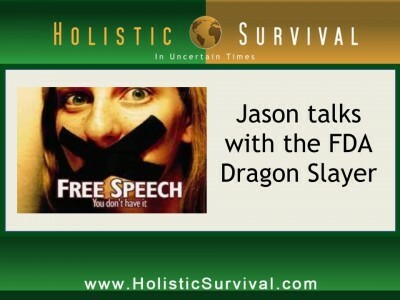 Jason Hartman: Welcome to the Holistic Survival Show. This is your host Jason Hartman where we talk about protecting the people, places, and profits you care about in these uncertain times. 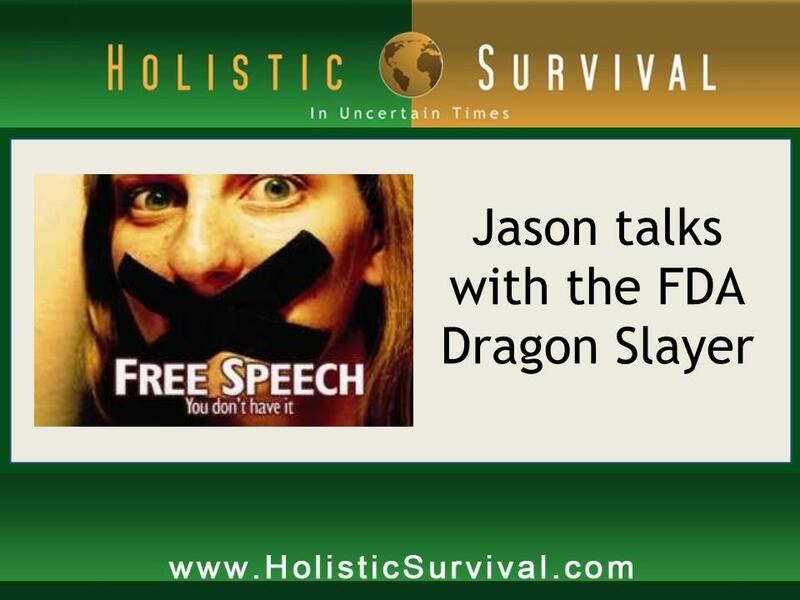 We have a great interview for you today and we will be back with that in less than 60 seconds on the Holistic Survival Show. And by the way, be sure to visit our website at Holistic Survival.com. You can subscribe to our blog which is totally free, has loads of great information and there’s just a lot of good content for you on the site. So make sure you take advantage of that at HolisticSurvival.com. We’ll be right back. Announcer: What’s great about the shows you’ll find on JasonHartman.com is that if you want to learn about some cool new investor software, there’s a show for that. If you want to learn why Rome fell, Hitler rose, and Enron failed, there’s a show for that. If you want to know about property evaluation technology on the iPhone, there’s a show for that. And if you’d like to know how to make millions with mobile homes, there’s even a show for that. Yep, there’s a show for just about anything, only from JasonHartman.com. Or type in “Jason Hartman” in the iTunes store. Jason Hartman: It’s my pleasure to welcome Jonathan Emord to the show. He is an attorney. He began his career with the FCC under Ronald Reagan and he practices administrative and constitutional law. And he has some really interesting things to say about your rights to free speech and about the Food and Drug Administration. And I think you’ll find this discussion very interesting. Jonathan, welcome. Jonathan Emord: It’s great to be here. Jason Hartman: Well, thanks. Your career has been a very interesting one in terms of your specialty and the breadth of your knowledge and so forth and the books you’ve offered. Maybe we’ll start with I think your first book back in the 90s that really dove into the origins of the first amendment, our cherished first amendment and other issues relating to communication, free speech, and then we’ll drill down as to how that relates to the FDA and I think our listeners may not really see that connection until you explain it to us. Jonathan Emord: Okay, well both in that first book, which is called freedom technology in the first amendment and in my recent book from 2010, global censorship of health information, I explain in detail how we came to possess the first amendment and the right to freedom of speech. You see, as the divine right of king in Europe became passé with the beheading of Charles I, there arose in Europe and England and throughout Europe an individual rights movement, largely dominated in England by a group called the Radical Whigs. And these individuals argued that they were entitled by birth to protection for a right to life, liberty and property, and that they were not beholden to the crowns for the freedom to exercise those rights, but that they were inherent in them, that they had a right to them just as the king had a right to his own rights to life, liberty and property. And this was a radical concept because the initial construct made up by Robert Filmer in his publications in defense of the king was the notion that the king was God’s emissary on Earth. He was possessed of all rights and that no one had rights except the king and by leave of the king and that the king could do no wrong because the king was effectively the law. Well, with the rise in parliament and the opposition to absolute monarchies, there came the idea that individuals should be possessed of rights and protected in those rights. And this then gave rise to the discussion in particular of the right to freedom of speech as the press became more prolific, as publication became more commonplace and more people became illiterate. It was possible then for people to debate issues of politics, to criticize their government, and to possess independent notions of science and it was possible for them to participate in the evolution of all these things. And there rose, in England, these things called coffee houses which were ale houses – more ale was dispensed than coffee. And people there would take newsprints, broadsides, read them aloud and share the information with others and then debate these things. And this gave rise to an opposition, political movement against the crown and the administration of the crown. And the same type of movement occurred throughout Europe. Ultimately, the philosophers of the enlightenment era came out of this environment and they abdicated the individual rights. Foremost, among those right, is the right to freedom of speech, the right to possess and to have control over what one thinks and the right to impart that to others, the right to criticize government. So when we come into the modern era, we find ironically that changes take place with the federal communications commission, with the food and drug administration, where the freedom of speech, as traditionally understood the freedom of the press, is violated in ways that the founding fathers would find to be a violation. As James Madison said in the first Congress of the United States, when the first amendment finally became adopted by Congress before its ultimate ratification 1498, he said that the first amendment disarmed this government of any power whatsoever over speech and press. There was to be no role for the federal government in manipulating or blocking or censoring or creating a prior restraint on the right to communicate. Jason Hartman: They’d be making a medical claim, right? Jonathan Emord: They would. They’d be violating a law and they could be prosecuted criminally and civilly. They could be incarcerated for as long as a life term or more and they could be enjoined from selling prune juice and they could have all of their prune juice seized in the marketplace. So this is an extraordinary power the government is exercising in order to protect a monopoly on the right to communicate therapeutic information in the hands of pharmaceutical companies. Jason Hartman: Okay. So, Jonathan, of course what you’re saying is scary and really offensive frankly in terms of our government having that kind of power, however the claim, as it always is with big government, “We’re doing it to protect the people and we don’t want a bunch of people out there making false claims. And this certainly comes up. It’s a constant battle I guess in the herbal industry, herbal supplements. And you can’t make claims that melatonin will help your sleep patterns or St. John’s Wort will enhance your mood or whatever, there’s a million herbs out there. When you take the government’s side or the FDA’s side of it, or they can’t get Kevin Trudeau off of TV for the claims he makes – I don’t know if you’re familiar with him and that story, but is there some middle ground here? Is there some happy medium? I mean should the government be regulating this at all or are you for complete deregulation? Jonathan Emord: Well, the bargain was struck at the time of the founding of the republic on the relationship between the federal government and the people and the nature of the government which was to be a republic. And what that included on the first amendment side was that government was disarmed of any power to censor speech. And instead what the government must do is carry the burden of proof. There’s no question under the first amendment that the government may not act against speech unless it has clear and convincing evidence that that speech both misleads and causes harm. Speech that is misleading but causes no harm is of no effect. Speech that misleads that causes harm, that induces you to purchase something or that causes you to take a step that is deleterious to your health or to your life, that is actionable by the state because it constitutes fraud. And this has been true historically and is a power that the government has, not related to the speech itself but related to the fact that the speech is used to induce an effect that is a form of theft. It is depriving you of your money or your life, predicated on a false representation. So there’s that power, which is a legitimate power of the government. Jason Hartman: So let me ask you a question about that then. It seems as though what the FDA has done is they have taken that power, which the state has to pursue fraud claims criminally and say that you can’t make these claims and deprive other people of course and that makes sense. But they’ve taken that and they’ve made it a pre-emptive right of the government to, in advance, say you can’t say this rather than saying it after the fact, right, is that the distinction? Jonathan Emord: That’s right. It is the use of prior restraint. The popular mechanism of the bureaucratic state is the use of prior restraint, not only in areas of speech but also in areas of any business practice, and that is, for example, that you will be forbidden from undertaking a certain action, or in this case communicating speech on the notion that a certain number of those who sell communicate will harm the public. So we’re all barred from speaking. We’re all gagged from when it comes to nutrient disease information because the supposition is if we’re not so gagged, a certain number of us will mislead the public. And this of course is a means to achieve tyranny or total control over people. It’s antithetical to individual liberty. Of course you should not be gagged on the supposition that you’re going to communicate falsehood. Were that the case, we would not be able to speak at all. Jason Hartman: Right. It’s a guilty until proven innocent scenario almost, isn’t it? Jonathan Emord: It is precisely that. It is the contrary proposition to the 5th and 14th amendment to the constitution. We have a right, a presumptive right to communicate. And it’s only upon proof, clear and convincing evidence, that you intend and actually are committing fraud if the government should have any power at all. Instead, there is this prior restraint in place which has had dire consequences in the case of we’ve defeated the FDA 7 times in federal court, 6 times on 1st amendment grounds. And in our first case, Pearson versus Sheula, we dealt with, among other claims, the folic acid and neural 2 defect claim. And that claim was one that was censored by the FDA for over 4 years, during which time an estimated 2,500 preventable neural 2 defect births occurred each year. And despite that injury, in order to protect the drug approval process from any form of competition, the FDA refused to authorize the claim. And it finally did allow a supplement claim for folic acid, but it took litigation of over 3 years and a landmark decision by the United States Court of Appeals for the DC circuit. And even then, even in the presence of the constitutional mandate, the FDA contumaciously, that is with contempt, refused to abide by the court order and had to be brought back into court and we had to feed them another time before finally they allowed this folic acid claim. All the while, you can bet your life that there were women out there who if informed that they should take a folic acid supplement at 400 to 800 micrograms, would have been able to avoid a neural 2 defect birth. And there are undoubtedly women during that period who had neural 2 defect births that were preventable. And it’s a travesty. We know now, since the second decision came down that that information has entered the marketplace, and CDC monitors the extent to which there are NTD births and extent to which women of childbearing age are aware of the need to take folic acid. And the knowledge, the awareness is increased tremendously, and the incidence of neural 2 defect births has gone down. Jason Hartman: I have a question about that. So congratulations you won that case against the FDA. I guess you can fight City Hall sometimes and that’s wonderful to hear. When you win, though, what was it? A supplement manufacturer that was wanting to gain their free speech rights? Was that basically the crux of the case? Jonathan Emord: Well, there were two scientists who designed supplements and licensed the formulas to companies as well as a number of public interest groups that had consumer members who wanted the information in the marketplace so that they and others like them could determine which supplements to buy and what quantitative amounts of various nutrients to ingest. And they were offended, deeply so because it affected their lives, by the government’s censorship of this information in the market. Jason Hartman: And so when you win against the FDA, do you win damages? Certainly, I would think that those women could come back, who have the neural 2 defect, could come back and sue the FDA for damages possibly. But does the manufacturer win damages because the FDA deprived them of free speech? Jonathan Emord: Well, unfortunately no. But there is a thing called the Equal Access to Justice Act. And if you qualify for reimbursement under that act, that is you have certain income within certain limits, you can get part of your legal fees reimbursed and that in fact is what happened. For the first time in FDA’s history they were required to pay litigants against them money for violating their first amendment rights by censoring their access to truthful and their right to communicate truthful information. They had to report that to Congress and they ended up having to pay over $100,000 to these people for their censorship of their speech. But that was a part of the legal fees over the course of 3 years embattling the agency. Jason Hartman: Wow, I want to hear more about the FDA and these issues and know more about some of the areas in which they may be really hurting the public by not letting scientists, manufacturers of various supplements and so forth, speak freely. But before we do that, you started your career at the FCC. And some people claim that the FCC is overregulating the airways and things like that, and not providing enough access. I know several years ago they allowed these neighborhood radio stations that transmit about a mile or something really low powered stations and so forth. Do you think that the FCC is doing that? And if so, of course their argument is going to be we don’t want the airways cluttered. Somebody’s gotta regulate it. The spectrum’s only so large. I just wanted to get your thoughts on FCC for a moment. Jonathan Emord: As I explain in my book Freedom Technology and The First Amendment, which is a complete history of the FCC in the first amendment and the extent to which that agency is a captive of the broadcasting industry and more particularly of the major networks. I explain there that the original error was made in the 1920s. Before the Radio Act was passed in the 1920s, and before the Federal Communications Commision Act was passed in the 30s, the broadcasters in this country would come to Washington once a year, meet with the Secretary of Commerce who was Herbert Hoover, and they would discuss with him interference problems and they would volitionally agree to change their operating parameters so as to prevent interference. So despite the fact that there were hundreds of broadcasters and the potential for interference, there was no interference because they respect the essential property rights of others in their operating parameters and avoided interference wars. Well, then Herbert Hoover, interestingly enough, because he was greatly offended by Jazz music on the radio and thought opera needed to be exclusively on the radio and he thought his son was having his morals corrupted by this racy jazz music that was coming on at night on some of the stations that were not the major network stations but were stations that catered to different rising ethnic and diverse populations, he thought that there needed to be greater content regulation. But he couldn’t get any currency in Congress for that idea. Then he decided he would effectively achieve radio regulation. He and various congressman and senators decided that they would achieve regulation by engineering interference wars. And what they did was they stopped holding these meetings for the volitional resolution of the interference wars and they also began granting licenses regardless of the interference consequences. And this then created a collision of voices on the airwaves and this demand for regulation. Well, even with the interference problems, very few people were calling on Congress to stop the interference. But the industry, that is the major networks, having come to agreement with Hoover on the aftermath – if there was radio regulation, they would be getting a lion share, and they would have their competition eliminated – they agreed to push for the legislation and so it passed. And so it passed. And then immediately after it passed, there was a bloodbath when the new head of the Federal Communications Commission engineered the spectrum allocations in a way that caused 600 radio stations to be shut down and gave the lion share of the marketplace to the major networks and their affiliate. Jason Hartman: Who no doubt contributed to various campaigns and so forth and initiatives. Jonathan Emord: Sure. And that’s reminiscent of how regulatory agencies have come to be in many instances. It’s been a collusion between government and industry that has resulted in it because the industry benefits from anti-competitive effects of the regulations. Jason Hartman: It’s either a government or a corporatocracy engineered false flag that creates regulation to keep competition out and then you hear these same companies and entities say “Well, we can’t stand government regulation” yet they welcome it in the back door because it eliminates their competitors. Jonathan Emord: This is absolutely the case. This is how the good manufacturing practice guidelines for supplements came to be. And there are over 1000 pages of regulations that concern the process by which supplements are made, giving government enormous power over the process, and pay little attention to the finished product and whether it’s actually safe. But they argue that government control over the process will prevent the injury – a very indirect way of doing it, but certainly the most costly way to do it. And so large companies can afford it and smaller ones can’t and they’re driven out of the supplement business. Jason Hartman: I have a couple of different companies, a couple of different businesses, and if I ever wanted to take them to the public markets and sell stock, the compliance burden is so enormous, of course all under the guise of protecting the consumer, the investor in that case, but there’s no way that I can compete in that world. I mean the Wall Street game is closed for me. Jonathan Emord: Sure. And one of the things in Freedom, Technology, and the First Amendment and two of our review articles I wrote, one called “The First Amendment in Validity of FCC Ownership Regulations” and the other one was called “The First Amendment in Validity of FCC Content Regulations”. In these articles, I explain that the operating parameters of existing stations could be made property rights. The whole idea, the justification for broadcast regulation is that the airways must necessarily be a public property and that therefore the government must regulate this public property, but that’s a bogus supposition because it’s not the airways that determine what is broadcast. It’s the operating parameters of the facility and you can define those parameters and they do in licenses and those defined parameters can be declared to be property rights. So rather than have a declaration of ownership of the airways, they can simply declare those who have been granted licenses to possess a property ownership interest in the parameters specified. Jason Hartman: Absolutely, yeah. You speak in a very lawyerly manner, so I just want to make sure that listeners and I understand this as well. Basically, your take on it, Jonathan, is that the government comes in and regulates preemptively when it doesn’t need to because owners of radio stations, television stations that use the airways, in the FCC case, they have the right to protect their property just as a land owner would. And if someone is interfering with their airways, coming too close to them on the spectrum, on the dial, then they would have recourse in court against that other party. And so the government doesn’t need to regulate it in the way they do. And with the FDA example, please correct me if I’m getting this wrong here, with the FDA example, if the manufacturer of prune juice, the example you used, wants to put on their label that it helps you be more regular, and if that claim is bogus then the consumer has the right to sue the manufacturer and say “Hey, this claim is bogus and the government has the right to go after the manufacturer on behalf of the people.” But they’re doing it preemptively. They’re doing it assuming that every manufacturer and every airwave operator is guilty in advance, right? Jonathan Emord: That’s right. And fortunately for us, the court accepted my arguments in Pearson and every subsequent case that the government simply cannot base its censorship on a fiction. In other words, the government cannot presume that you are going to speak in a misleading way. In the Pearson case, I remember distinctly the brilliant judge – each of the judges on that panel were very intelligent and able, but Patricia Wald, who has since retired from Court of Appeals really hit it on the head when she was engaging in a little colloquy with the Justice Department’s attorney during her Justice Department’s attorney oral argument. And she said “Look, I shop at Fresh Field”, it was called Fresh Field then, “And I see other customers in the store and I’m not particularly convinced by your argument that people are so stupid who shop for vitamins and minerals and health food that they would be so gullible that they would believe everything that they were told. I think that these are discerning people and that if they are told that scientific evidence associating a nutrient with a disease is less than conclusive, that is that it’s inconclusive, they would appreciate that they would have to essentially make a bet or guess and place faith in the potential of the association, of if they’re extremely conservative choose not to believe in the association until more proof is mustered. But to deny them access to credible science associating the nutrient with a disease is to censor that and to deprive them of the opportunity to exercise and election based upon it. And that’s a paternalistic government response that is antithetical to the first amendment. I’m putting words into our mouth, but I’m developing the argument consistent with what the court actually decided. And the court brilliantly created this landmark decision that has stood over a decade now, enabling us to go back into court and fight for people’s right to communicate everything from the folic acid I discussed to Omega 3 fatty acids, reducing the risk of sudden death heart attack or heart disease and selenium reducing the incidence of cancer, and the list goes on and on really with various nutrients that we’ve been able to get through, B6, B12 and folic acid and reduction in almost 16 levels associated with our increased risk of heart attack and stroke so that people can actually get this information in the market and they can appreciate what is almost a truism for everything in science that the evidence is inconclusive. But that doesn’t mean that it’s incredible. There’s credible science and the public has a right of access to that. If we were to allow only information that was proven scientifically to a conclusive degree to enter the consumer market, then you couldn’t say for example that a lawnmower will be able to cut grass or that a safety restraint in an automobile will reduce your risk of death in an automobile accident or that consuming foods that have a rich in fiber and antioxidants and fido chemicals can increase your longevity by reducing your overall risk of cancer. You would be incapable of communicating anything related to that in the market. Now, of course they do prohibit the nutrient information but they don’t prohibit you from understanding that a restraint in an automobile might save your life if you get in a car accident. Jason Hartman: That’s an interesting comparison, it really is. Are you familiar with Leatrile? I know that there are many people that think that that has been shut out of the market by maybe the pharma companies as a cancer cure or cancer treatment. Jonathan Emord: Well, Leatrile which I understand is a B Vitamin, there is credible evidence that associates Leatrile with beneficial effects on immune system function. Whether or not it is capable of preventing or treating cancer, I don’t know. But I can say this is that a blanket ban on the right to communicate information just as it is on every other nutrient and its therapeutic effects is just really ensuring that people suffer and experience premature death over and over again. I mean the FDA stands in the way of you being able to go into the grocery store and see in the grocery aisle various information at the point of sale that says various foods and various supplements have these potential effects. I mean you would be able to get handouts in the grocery store free of charge, that would identify products that say “Oh hey, if you have heart disease you are certainly going to be interested in these fruits, these vegetables, these supplements. If you have cancer, you would be interested in these. And it’s not that these things necessarily will cure or treat your disease, but they may have a beneficial effect upon your overall survivability if you have these conditions. Jason Hartman: Sure. And your position is you just want the speech to be available and the news to be available to people, and the debate to be open and out there for people to consider and make their own decisions, right? Jonathan Emord: Yes. And this gets back to my love for the first amendment. I mean we are sovereign in our rights over freedom of speech and press. It is our right. It’s not a thing that we exercise by leave of the government. I mean it should never be a situation where we can only communicate the truth about a nutrient when the FDA deems it fit for us to have the opportunity to do that. That’s backwards. It’s the FDA that’s supposed to be enshackled. It’s supposed to be our servant and we are supposed to be able to communicate truthful information. If we’re not in the business of de-frauding people, then we’re in the business of disseminating truthful information. There’s no role for the government to stand as a gatekeeper, to second guess our judgment as to whether what we’re saying is in the best interest of those who are receiving it. If it’s truthful, we have a right to speak it. And if it’s truthful, individuals have a right to receive it and to interpret however they want, to place credence in it, to place extreme faith in the ultimate outcome that may come from it, or to be highly skeptical. That is their right. That is the nature of the first amendment. It is a protection of individual sovereignty. It’s more than just a barrier to the right of government to interfere with the speech market. It really is a defense of individual liberty. It’s a defense of our sovereignty over the matters of speech and press. Narrator: Now’s your opportunity to get the Financial Freedom Report. The Financial Freedom Report provides financial self-defense in uncertain times and it’s your source for innovative forward-thinking investment property strategies and advice. Get your newsletter subscription today. You get a digital download and even more. The price, only $197. Go to JasonHartman.com to get yours today. Jason Hartman: You’re based in the DC area and I was there last October and I remember walking through the national archives, second time there, and I just got goosebumps. So when I was looking at the Declaration of Independence and the Constitution, thinking this is really the highest achievement of mankind because out of that has flowed just so much innovation and such incredible amounts of knowledge and invention and discovery. It’s without that fundamental right and it’s really the first amendment, fitting that it’s first because without that the communication just doesn’t occur and people don’t exchange ideas freely. And there’s not a marketplace of ideas. And progress is massively inhibited, isn’t it? Jonathan Emord: It’s definitely true. I mean out of the enlightenment in European history, the political pinnacle was Locke in Philosophy, the Two Treatises of John Locke, became the ideological foundation for the creation of a republic that would enable people to have the maximum liberty with a government that was designed for the purpose of defending peoples’ rights. And this was an extraordinary thing. But even more extraordinary was the fact that the founding fathers of this country chose to create a written constitution that would create the very republic necessary to achieve a realization of the hopes and dreams of John Locke and his two treatises and would create this magnificent government that was to be limited in its powers. Its very purpose was to protect individual rights. I mean the Declaration of Independence tells us that governments are instituted among men to protect the rights of the governed. And when they become destructive of those rights, it is the right of the people to alter or abolish them. So it is the very purpose of the republic that was created to protect our individual rights and to secure those rights from invasion by the government so that we can remain sovereign and that the government would be our representative and would do those things which we could not, in defense of liberty, that is the general welfare and defense of the country would be protected but only to the extent that the powers were enumerated in article 1 of The Constitution. And yet we have, for example, the health care reform law of President Obama which is a gross deviation from this plan that robs us of our individual liberty. Jason Hartman: And fortunately we had some good news from a federal judge this week on that exact plan and how unconstitutional it is to force people to buy government mandated insurance, right? Jonathan Emord: Well, that’s right. And we have a case pending also on this very subject matter in the United States District Court for the Northern District of Ohio on behalf of the United States Citizens Association. And that case is about to be decided. We’re in the final stage of pleading practice there. And we’re hopeful, we do indeed hope that that decision will come down also holding the health care bill unconstitutional. We will rise up with the Virginia and the Florida District Court decisions to the Supreme Court where we hope the Supreme Court will do its duty and defend The Constitution. See, the extraordinary thing about this case is that for the first time in American history, the government of the United States, without using the taxing or spending power, is presuming to tell you how you must spend your after-tax dollars to achieve an objective of the government. The government wants everyone to be insured. And in order to achieve that, it is forcing all those who are presently uninsured to buy health insurance at between 5 and 15 grand a year. Well, people object to tax increases for a lot less, but this is an extraordinary tax increase. Jason Hartman: Of course it is. Jonathan Emord: Predicated on the exercise of a power that is nowhere in article 1 of The Constitution. There is no power to compel you in the federal government to purchase something with your money after tax dollars, purchase a private product. There’s no power of that sort. Jason Hartman: That’s a really interesting distinction, Jonathan. I’m really glad you brought that up because I think very few people noticed that they’re not taxing you per say, they’re telling you how to spend your after tax dollars. But I’ve got to just question you on that because don’t states do this? Like my state of California with auto insurance? Jonathan Emord: No, they don’t. They tell you that if you’re going to drive a car on the public highways you have to have your car be insured. They tell you that. But you don’t have to drive a car, the freedom not to drive a car if you so choose. In this instance, you don’t even have that liberty. If you breathe, you must be subject to the health care reform law. You cannot escape it. There is no out, there’s no option for you to be freed from it. It doesn’t apply only to those who are already in the insurance market. It doesn’t apply to those who would otherwise be interested in a paining health insurance. It applies to everyone, including those who expressly do not want and do not have health insurance coverage. It is forcing people against their will to expend their money in every circumstance – there’s no option out of it. And furthermore, it’s a federal power. The states are possessed of plenary powers welfare powers that vastly exceed the federal government in the original constitutional plan. The Constitution specifies a government of enumerated powers that are limited and all other powers are reserved by the 9th and 10th amendments to the people and to the states. So even if you were to have some currency in the argument that automobile insurance is mandated by the states, it has no necessary bearing upon the federal government because the federal government is expressly one of enumerated power. If the power is not enumerated in article 1, it does not exist for the Congress of The United States to exercise. Jason Hartman: Absolutely. And the protection there is that people would have the freedom to move to another state and they would have that opportunity to do so while still being under the limited powers of the federal government, so they would have an escape hatch. I don’t want to keep you too much longer here and I want you to tell people where they can buy the books and so forth, but this battle with health care is probably headed for the Supreme Court I would assume. What is your outlook on it? I’m hoping that we won’t be forced into such a ridiculous plan, but what do you think? Jonathan Emord: Well, I’ve always said as a litigator with many years of experience, 25 years of experience doing this, it’s only a fool really who predicts what a judge will decide. It’s impossible to predict what the justices of the Supreme Court will ultimately decide in this case. I can only hope, and I believe this to my core, that if The Constitution is to be defended, we have to prevent this precedent from taking hold because if the government of The United States can compel you to buy health insurance because it wishes you to make that private purchase, there’s no limitation to what the government can compel you to purchase with your after-tax dollars. And what will happen is in no time the federal government will be asking you to purchase an electric car, will be asking you to purchase green related products and services, will be defining for you how much of your budget you should expend on healthy foods of one kind or another. The list is endless of what the government could do to compel you if it is able to mandate how you spend your after-tax dollars. And the effects will be to monopolize more and more of your money. And if you have only a small segment of what you earn available for you to purchase freely, you certainly have no freedom left. I mean you’re just a mere instrumentality of the government if everything you do when you go to the store is dictated in no small measure by what you’re required to purchase. Jason Hartman: It is amazing to me that people keep trying this experiment that has failed so many times, the big government socialist, powerful, controlling, nanny-state type of government has never worked at any time in history, it has never worked at any location on the planet, it never will work, it is evil – it’s the root of evil, it really is. Well, you’ve got 3 books, The Rise of Tyranny, Global Censorship of Health Information, and Freedom, Technology, and the First Amendment. Where can people get the books and what else should they know? Jonathan Emord: Well, The Rise of Tyranny is a book that describes since the 1930s how the American republic has been transformed from a republic into a bureaucratic oligarchy, essentially how it came to be that 9/10 of all laws that are passed by the federal government are the product not of our elected representatives but of the unelected bureaucracy and how that means in the prediction of the framers of the constitution that that would be the end of liberty in this country and the birth of tyranny, or as I say in the title of the book The Rise of Tyranny. And that book as well as my other books are available through Emord.com. Global Censorship of Health Information discusses the origins of the first amendment, explains how those origins came to be from the 15th century, 1400s until the present, and how ultimately those ideological origins of the first amendment led to the first amendment and the arguments that ultimately held sway in this country to create an absolute denial of federal power over speech and press and then how the modern regulation of health information has essentially protected the drug industry’s interest to the exclusion of private interest and resulted in censorship of truthful information world round, wherever drugs are regulated, and then it explains a way out as does The Rise of Tyranny, a way back to liberty. Then the other book we were talking about, Freedom, Technology, and the First Amendment discusses the origins to the first amendment, more particularly the Anglo-American origins, and then it discusses the origins of radio regulation, modern broadcast regulation, cable regulation, and how again the very interests that were regulated became the entities that controlled the agency and pursued their own interests through use of a public interest veneer that defined for the public one set of perceptions. But in fact deal making characterized that agency as it does the FDA. Jason Hartman: He said that while working at the FDA? Jonathan Emord: Yes. And, in fact, he not only said that but he said many other things as well as other FDA people. For example, Dr. David Ross, who’s an FDA medical reviewer, said this: “Even if a product doesn’t work or we don’t know how it works, there is pressure on managers that gets transmitted down to reviewers to find some way of approving it. There’s been a cultural shift at the FDA and now the pharmaceutical industry is viewed as the client. And, in fact, in January of 2009, 9 FDA physicians and scientists, in desperation, wrote to President Obama, risking their careers and being ostracized at the FDA and to the then Chief of Staff John Podesta, and they said in their letter “Managers have ordered, intimidated, and coerced FDA experts to modify scientific evaluations, conclusions, and recommendations in violation of the law and to accept clinical and technical data that is not scientifically valid. Jason Hartman: Very, very, very scary, isn’t it? Thank God there are people like your firm, Emord and Associates, out there fighting for the people. We appreciate your work, we appreciate you communicating this to people. And by the way, I just thought I’d spell the website: Emord.com. There’s a lot of interesting stuff there, shows about some of your landmark cases and your various work, a lot of articles on there as well. So great work. Thank you so much, Jonathan. We really appreciate having you on the show today and sharing this valuable information. Jonathan Emord: You’re welcome. I’ve enjoyed being with you. Female: I’ve never really thought of Jason as subversive. But I just found out that’s what Wall Street considers him to be. Female: Stocks and other non-direct traded assets are a losing game for most people. The typical scenario is you make a little, you lose a little, and spin your wheels for decades. Female: We can pick local markets untouched by the economic downturn, exploit packaged commodities investing, and achieve exceptional returns safely and securely.